SuperPhillip Central continues its push towards its 600th review with Adventures of Pip, a newly released game for the Wii U eShop and Steam. I'll be covering the Wii U eShop version with my review. See why you should definitely think about checking this newly released game out! The Wii U is in no shortage of 2D platformers, whether they come from Nintendo (Donkey Kong Country: Tropical Freeze and New Super Mario Bros. U), third-parties (Ubisoft's Rayman Legends), or independent developers on the eShop (Shovel Knight, Stealth Inc. 2). It takes something special to differentiate your 2D platformer from the crowd, and it's usually through creating a unique hook in the gameplay. Tic Toc Games's Adventures of Pip has this hook, and it isn't just there as a gimmick either. It hugely impacts the gameplay, creating one of the better platformers on the eShop and one of the better game on the Wii U in general. The main gameplay mechanic of Adventures of Pip that sets it apart from other 2D platformers is Pip's ability to switch between forms. A total of three forms are available, having Pip switch between a mere pixel, an ultra lightweight form that allows him to glide in the air and slowly drift to the ground, as well as ride on wind tunnels; an 8-bit form that grants Pip the ability to run fast, wall jump, and even plant himself on walls; and a 16-bit form, which is slower and heavier than the other forms, but can unleash a sword strike to destroy certain blocks. 8-bit Pip is a fast runner and great jumper. In order to switch between forms, Pip needs to defeat special crystallized enemies. Each enemy defeated will "evolve" Pip to a higher bit form. Meanwhile, switching to a lower bit form has you holding a button and unleashing a special aura that can destroy enemies as well as pink blocks. On many occasions, especially later in the game, you'll be switching between these three forms one after another to perform feats of platforming awesomeness. 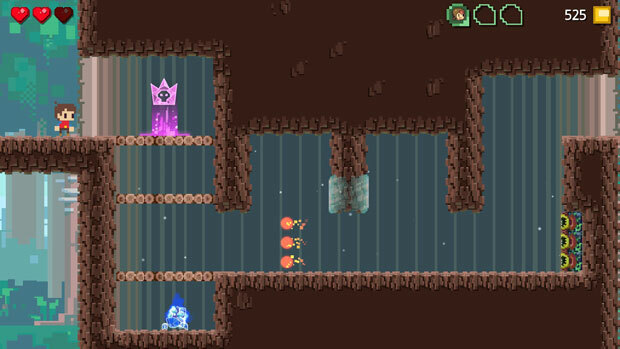 Those crystallized enemies I was talking about are placed in apt locations to keep the flow of switching between pixel and bit forms feeling natural and nary requiring annoying backtracking. There are 36 levels within Adventures of Pip, spanning five worlds. Each level consists of its own platforming challenges, whether it's riding stone blocks across rows of spikes, wall jumping to avoid rising lava, or riding along lifts over hazardous bottomless pits. Thankfully, checkpoints are fairly well distributed, so dying doesn't present too much of a punishment to the player. A sight to behold-- the checkpoint! Oh, how I've missed you! Every level in the game houses three hidden villagers to find and collect. This is completely optional, but it stretches the longevity of Adventures of Pip greatly. There are some that will take lots of experimenting to find, as the game loves hidden alcoves and fake walls. Usually these have environmental hints to their locations, but others require pushing up against every wall in hopes of that being the one housing the hidden villager. Each final level in the game's five worlds consists of a boss battle. These require Pip to change between forms to attack bosses when their guard is down and defend against boss attacks. These are mostly three hit affairs, and while that's the cliche, the bosses themselves are anything but. Some really creative designs and patterns are implemented to keep the battles engaging no matter if it's your first time fighting them or the seventh. Bah! Where's a can of Raid when you need it? Bosses drop extra hearts to add to Pip's health, similar to The Legend of Zelda's heart containers. You can also return to the town at the start of the world map to purchase extra hearts, helpful items, and bonus abilities from the two shopkeepers there. 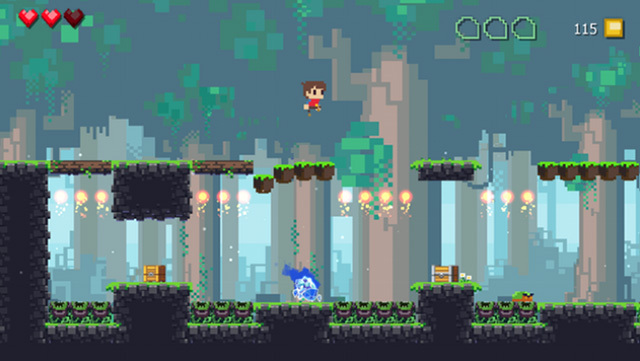 The currency of Adventures of Pip is that of pixels, which are dropped by defeated enemies and found within countless treasure chests sprinkled throughout the game's levels. Thus, your journey can be a much less hazarouds one-- after all, it is dangerous to go alone. 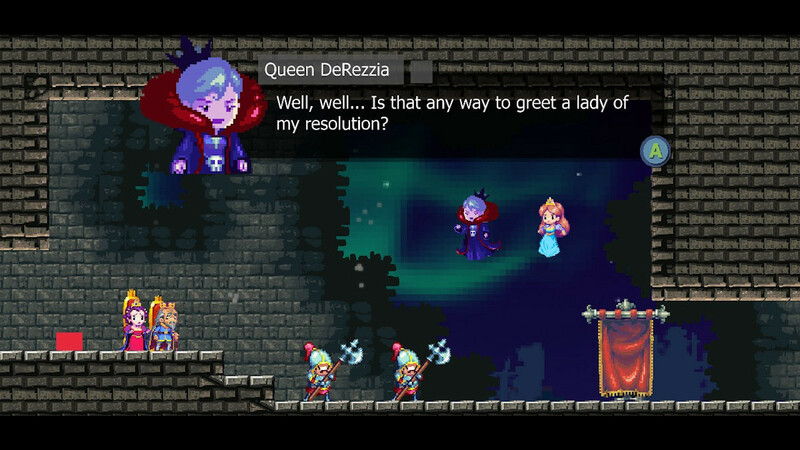 Adventures of Pip's story has an evil queen turning the kingdom's king and queen from 16-bit form into low-res pixels. 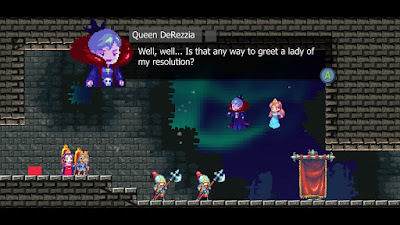 It's up to Pip, albeit in modest pixel form as well, to travel the kingdom to defeat the queen in addition to rescuing the princess that the evil queen princess-napped. All the pretty ones have an attitude problem. The game itself runs relatively well, but there are sporadic but quick instances of slowdown here and there. The visuals creatively blend multiple eras of gaming graphics together, with 8-bit backgrounds and 16-bit enemies and boss characters. Pip himself animates wonderfully, correctly displaying the characteristics of the eras of bits (8-bit, 16-bit, etc.) his various forms represent. The music by Jake "Virt" Kaufman is a collection of adventurous themes and songs that perfectly fit the areas and environments they are played in. It's a superb soundtrack, overall. 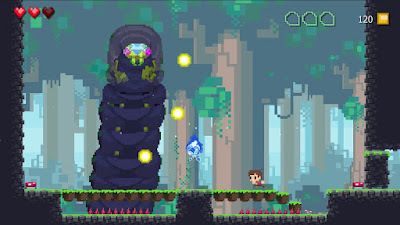 Adventures of Pip's success comes from excellent level design that constantly throws new challenges in the way, slowly getting you comfortable to more difficult trials, and a creative evolution and devolution bit transformation gameplay mechanic. For those who want to go for all 108 villagers, the amount of time you'll spend with the game is well worth the asking price of $15.00. For everyone else, there is still a rewarding game that is worth playing over and over again much like the classics that gamers like myself grew up on.